The Karnali River for Many experienced river rafters, who have rafted or kayaked down the Karnali agree that it is one of the best trips offered anywhere. Rising in the vicinity of Tibet’s holy Mount Kailash, the Karnali gushes through a series of magnificent gorges and canyons from the high Himalayas as it descends slowly into the forests of western Nepal. Seasonal snow melts and storms can cause the river level to swell drastically and create the extremes of white water rafting. In high water the Karnali is a serious undertaking with huge rapids. Even at lower levels the river is not easy, the rapids become more constricted and the gradient steeper. One highlight of this classic river journey is a 7 km long gorge ‘Thrill-a-minute roller-coaster ride’ where there is a rapid at almost every bend. Truly though, any season suits the Karnali. More and expedition than a rafting trip we brgin with a bus journey into the remote and almost untouched region of western Nepal,crossing through part of the Bardia National Park. An alternative is to fly to Nepalgunj then make a 5 hour bus journey to Surkhet. From here there is another drive of around 4 hours, to get to Kalyani Danda, the last stop. 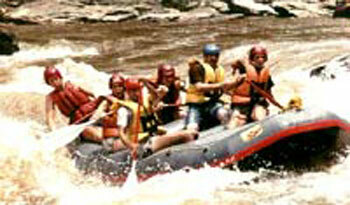 The river section lasts 7 days including one rest day. At the end of the trip, you can choose to take a detour to Bardia National Park for a Safari.